Heath avenged their home defeat earlier in the season with a 19-10 victory in yesterday’s Yorkshire One derby against Old Rishworthians at Copley. The pitch was in surprising good condition at Copley after the recent downpours and the afternoon started fine and sunny but the wind from the east ensured a bitterly cold afternoon for players and spectators. Both teams were ‘as per programme’ with fifth-placed Heath preferring Ezra Hinchliffe to start at fly half with Jack Crabtree on the bench alongside evergreen Mark Puttick and Dave Skinner. Heath kicked off with the wind at their backs but within three minutes had conceded a penalty 30 metres out which home scrum-half Eddie Cockroft pushed wide. The eighth-placed hosts had most of the early possession, with their powerful front row of Harry Whitfield, Chris Stone and Josh Crickmay conspicuous along with fly half Josh Kelly and centre Ben Waud. However, Heath’s tackling was sound and their fullback Eddie Cartwright repeatedly pushed his side deep into the home team’s 22. On 18 minutes, Rishworthians were penalised for handing the ball out of a scrum but Hinchliffe’s attempt at goal from 40 metres went wide. A high up-and-under put Heath on the home 22, then a penalty kick into the corner set up a lineout which their captain Ian Downsborough won. The pack drove and Olly Cook scored a try which Hinchliffe converted. Rishworthians came back strongly. Cockroft missed a penalty but slipped through a gap to set up a prolonged assault of the Heath line. Outstanding defence, led by Richard Brown, eventually enabled Eddie Cartwright to clear. Heath kicked into the corner and a well-executed miss-move in the centre of the field got the ball to Callum Harriott-Brown but the flying winger was well marked. The move yielded nothing except a missed attempt at goal after play was taken back for an earlier infringement. In the second half, with the wind dropping, Rishworthians ran a penalty eight metres from the posts but a knock-on was Heath’s salvation. Heath enjoyed a good spell of possession, moving the ball fluently, and after a Bradbrook break Harriott-Brown scythed through to score near the posts. The conversion attempt was unsuccessful and within a minute Matt Beasty was sin-binned for a deliberate knock-on and Cockroft put the home side on the scoreboard at 3–12 with 15 minutes to go. Heath were under pressure and a beautifully timed, delayed pass to Billing, who came through off his wing, produced a try under the posts which Cockroft converted to cut the gap to two points. Then, out of nowhere, came the blizzard and Heath sealed victory with one of their hallmark tries, a driving maul from 30 metres out. 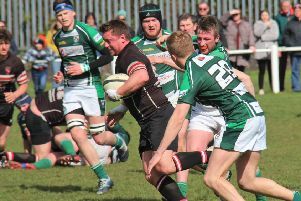 The try was accredited, fittingly on St Patrick’s Day, to Heath’s Irish prop Chris Moore. Hinchliffe converted and Heath moved up one place to fourth.